Protective covers for window wells are available through CK’s Windows and Doors. Each window well cover is manufactured and designed to look beautiful and serve as a sturdy, protective grate. Basement well covers keep debris, animals, and children from accidentally falling. Window well covers can also keep sagebrush, trash, and other debris from collecting in the window well. The covers have several purposes and will give you peace of mind knowing children or pets are safe playing near your home. Take the extra precautions needed to secure your home and prevent future accidents. View our selection of basement window covers below. Safety Grates – The safety grate is made of rolled angle iron steel and steel safety bars. It is designed to keep people and pets out of the Easy-Well and hold the weight of foot traffic. 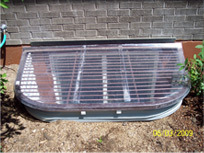 Lexan Flat Cover – The plastic grate cover is made of a polycarbonate plastic and is designed to be used with the grate. It is used to keep debris, animals, and excess water out of the Easy-Well. Call CK’s today with your window well dimensions, and we’ll reserve your covers and grates for pickup. 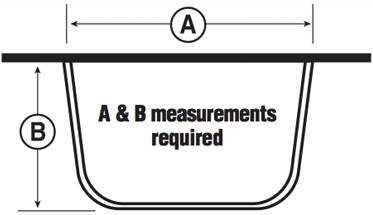 Instructions on how to measure the dimensions of your window well are provided below. Purchasing window well covers today is one step closer to prevent window well accidents near your Idaho home. 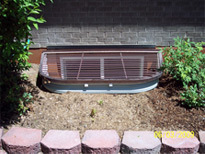 If you have any questions about window well covers in Idaho Falls, call us today at (208) 528-8070. We’d be happy to answer your questions. A. Take the measurement of the foundation from end to end of the well. B. Then measure from the foundation to the end of the well.